Sorry to disappoint those who might think such a tour might include stories of visits to the saucy streets of Amsterdam or others who might be expecting a reimagining of the 17th century toff travels in renaissance Italy. No, although we may have pinched some of the title of the latter, our journey was inspired solely by the type of grind associated with coffee, speciality coffee or otherwise and more simply known as good coffee. Made from beans grown by farmers in identifiable villages, who get paid a fair price for the labours and premium beans. My boss, wife and travel partner is the owner of Marmadukes, which she, with a bit of help from me, opened in 2012 and I’m pleased to say is doing quite well. As of course are lots of other coffee shops all around the UK. The chains have continued to grow and expand throughout the dark days of the recession, but I’m proud to say not quite as quickly or as strongly as the independents. Sheffield itself is blessed with a good number of great places including Upshot, Bragazzi’s, Tamper and Steam Yard. But why are great new cool coffee shops springing up at a time when our High Streets are struggling? Regular articles and reports have over the years asked why. Allegra’s 2017 progress report sets out the very latest: The £9.6 billion UK coffee shop market grew by 7.3% in turnover during 2017, making it one of the UK’s strongest performing sectors. Project Café2018 UK, the definitive new report from Allegra World Coffee Portal, reveals that the total UK coffee shop market added 1,215 stores over the last 12 months to reach 24,061, representing 5.3% growth. So clearly we love our cafes and coffee shops, if not the coffee, more than ever and it’s now big business. This success is probably due to a number of things: there is better coffee available, in nicer places, providing an appealing alternatives to pubs. Cafes and coffee shops also now do much much better food than they used to. We also know many people would like to open their own coffee shop or cafe. But, before you go rushing off to blow your life savings on that lovely little empty shop that’s just come available on your local High street, stop, and think. It’s a big decision and it should be made only when you are armed with all the facts, because that’s exactly what we didn’t do. Research is essential, find out as much as you can. It’s disappointing for us when customers don’t give more thought to where they buy their food and drink. Does the shop care about its staff, the produce, whether they pay their fair share of tax. So, although our essential research didn’t happen when it should have this trip we concluded still well worth it. The cafe or communal coffee drinking concept you may be surprised to know came from the middle east, primarily because in the 17th century Muslims needed a place to meet, other than inns, where alcohol would be served. Radio 4 did a fantastic programme not so long ago called The Mohammadian Bean. Worth a listen if you can find it. Coffee shops have since this time been a place for people to come together to share ideas or just to chat, complain about the weather or Brexit. In a time when people increasingly stay home and live through their mobile phones and the internet its good to know there are still things out there that inspire people to get out of their homes and interact face to face. So many things happen in cafes, life happens. Our most popular social media post came about when two young people met and chatted on neighbouring tables. One left and the other then declared to us her interest in continuing their conversation. People connected to the story and we found him, unfortunately it wasn’t’t the fairy tale ending we all hoped for, but hey that’s life and thats what you get in cafes all around the world. People doing business, meeting, breaking up, each and every day. Exciting stuff. Speciality coffee started in the 90’s, on the other side of the world as good quality independents started to emerge in places like Seattle. But, where this 3rd wave as it’s sometimes called, really blossomed was down under, with our antipodean contemporaries. The coffee culture in both New Zealand and Australia we have always been told is very much part of their culture and that’s why they do it better than anyone else. Places such as St Ali’s in Melbourne or Flight in Wellington. These were places other coffee fanatics would talk about with such reverence and esteem, but were they are they really that good, so different, so much better than us? For while now we were desperate to find out, so when a wedding invite came our way inviting us to a wedding, in New Zealand and in that same wedding invite it indicated that the reception was due to take place at Prefab, one of the best coffee shops in Wellington, if not New Zealand, our plane tickets were very quickly booked. 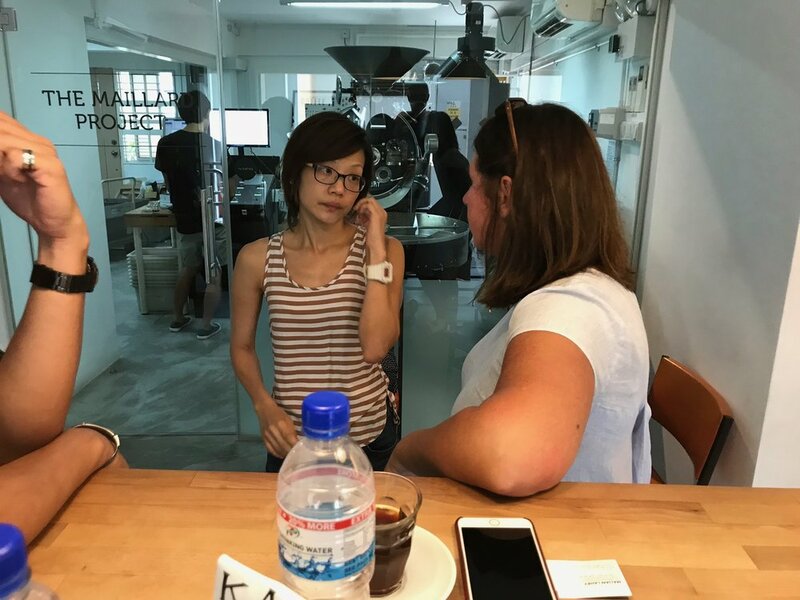 During that booking process Clare realised that one of our former barista’s, Dexter, was now working in Singapore, so she suggested we could incorporate a little south east asian element into our tour. I’m so glad we did. Our first port of call though would be Sydney, if you don’t include a stressful quick turn around in Dubai airport. Famous for it’s Harbour Bridge and Opera House yes, but would Sydney cut it as far as its coffee scene was concerned. Now, I have to say at this point that our travels lasted 5 weeks, so it would be impossible to visit all of the best places in these three countries. Clare, who is the most avid of researchers, did have one or two must visit places on our schedule, but seeing all the best places would be impossible in so short a time. Sorry, that’s what I’m trying to say, to all of the great coffee shops that we didn’t manage to visit. We will check you out next time, promise. After recovering from an extortionate $83 taxi fare we hauled our over filled suitcases into the reception of the Old Clare Hotel. (how did she find such a namesake place?) More importantly it is a great little hotel, a terrifically quirky mix of the old and new architecture and design. I couldn’t resist throwing myself into the antique dentist chair in the foyer as Clare booked us in. Quickly abandoning our bags we ventured out onto Kensington Street, which had as part of it’s form a little off shoot area called Spice Alley. Unfortunately it was quite late, so none of the coffee shops we spotted were open, but our appetite was well and truly wetted and I couldn’t wait for my morning coffee and to get The Grind Tour properly under way. Clare is a night person, me, I’m all about the morning, so when I woke around 5.30am I felt like an 8 year old boy waking up on Christmas Day. Surely, no-where would be open, would it? Somewhere was open, but I didn’t actually find it until the following morning, a tiny kiosk at the front of a place bizarrely and inappropriately called The Posh Hotel. It wasn’t a speciality coffee shop, but their flat white was as good as you would get in most places in the UK. Anyway, back to my first morning and coffee in Australia. Glider is a small coffee shop on the same street as our hotel. I broke my duck with a nice filter served in the cutest little bottle and cup. Most speciality coffee is single origin, so I was surprised to discover that this, their own house filter, was a blend of 3 beans. I’m told this is common in Australia. Still, not a bad start. 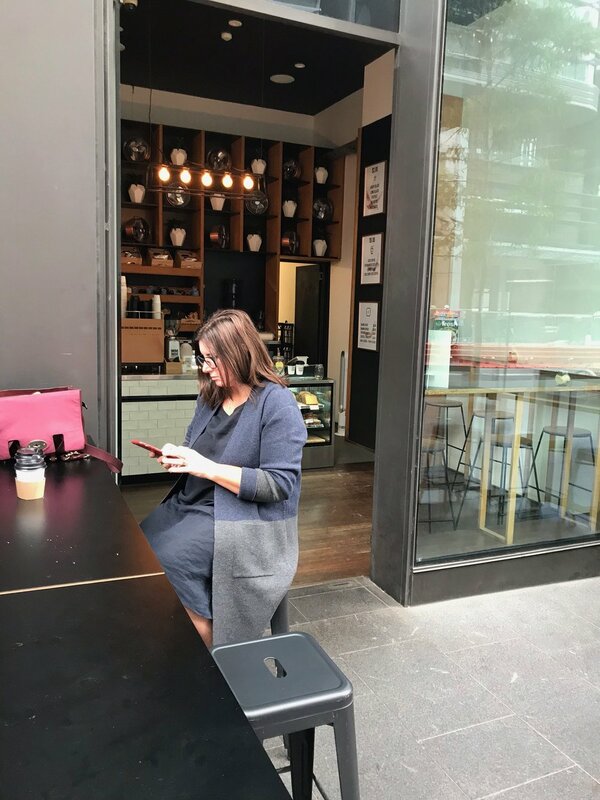 After breakfast, like most other tourists, we headed for the harbour, but on our way couldn’t resist detouring slightly to pay Paramount Coffee Project in Surry Hills a visit. Another super cool looking place, serving great coffee and food. The only minor negative being a heavily botoxed lady sat alongside us, who was accompanied by a snappy little ornamental poodle. No matter Paramount was definitely worth the detour and after 4 coffees we were sufficiently energised to walk the mile or so to the famous Sydney harbour. If you ever go to Australia you shouldn’t really need telling or reminding that slapping on a bit of suncream is an absolute must. You’d be really silly not to, even on an overcast unsunny day. By the time we left Sydney the following morning my nose and forehead looked something like the bircher muesli I’d consumed earlier. My pale delicate Anglo-Saxon skin wasn’t ready for those sneaky rays and it would be well into the 2nd week of our tour before the blistering disappeared. Rule 1, don’t forget to put on your sunscreen, whatever the weather. However the harbour walk was definitely worth it and although you’ve no doubt seen it a million times, from many many different views, here’s ours. We arrived in Wellington tired, but excited for what lay ahead. Having heard and thanks to Lord of the Rings seen what a beautiful country New Zealand is so many times we looked around in wonder. The three weeks we spent there confirmed everything ten fold. Around every corner is a ‘wow’ moment waiting for you. After a while you start to take it for granted, but we tried our best not to. Wellington itself is without doubt beautiful, and also an interesting mix with its parliament buildings, museums and large financial district. Our fabulous hosts, the totally wonderful Jules and Mark, were aware of our passion for coffee and proved to be the most willing of cohorts on this particular leg of our tour. They were already proud users of their coffee scene and couldn’t wait to show us Cafe L’Affare coffee roasters, Havanna Roastery and of course, Prefab. It came as a bit of a surprise that they had never been to Flight - Hangar, one of our must visit places. In truth none of them disappointed. L’Affare Coffee was maybe a little past its best, but the other 3 were a joy. As was Poneke, a little place I found on my solo travels down by the marina and Seashore Cabaret, where we caught up with the lovely Petra, a former Marmadukes member of staff, who was also studying architecture in Sheffield. Our city is truly blessed by it’s international students and renowned universities. With all this great coffee available in such great places it just makes you want to go there, to be there, to stay there longer than you probably should. How do they get any work done I began to to wonder? Prefab, our wedding reception venue, is a truly remarkable place. When I posed the question earlier about just how good are the cafes in New Zealand, this is where I found at least one answer. And here’s where I need to wear two hats, of a customer and owner of a speciality coffee shop. As far as the customer experience is concerned I would say we might be able to give them a run for their money. Our coffee and food is probably as good, if not better. But, the place, the business itself is the creation of one of 3rd wave speciality coffee shop pioneers, Jeff Kennedy. He came from the US in the 90’s and built up the cafe L’Affare roastery empire, which he sold several years ago. Not one to sit on his success he decided then to go into making and distributing coffee cups. He is the founder of ACME, one of the most popular specialty coffee cups around. Eventually, he couldn’t resist getting back into the game and using all his years of knowledge and experience created Prefab, a space that from a coffee shop owner’s perspective which is outstanding. Certainly I haven’t seen anything in the independent sector to match it, maybe Caravan in London comes close. It’s big, but it needs to be, it’s always packed. Inside and outside everything works, doors and windows don’t just open, whole sides of the building can be opened up if the event needs it. This is what happened at the wedding reception on a very warm evening as the inside and outside space became one. I was lucky enough to spend a little time chatting to Jeff as he roasted some coffee beans behind the bar. He was quiet and watchful, and clearly had incredibly wealth of knowledgeable. He would occasionally pass on the odd tip, and then with perhaps typical US magnanimity tell me they were for free. Regardless, he impressed and intrigued me. Flight - Hangar is a coffee shop for the purist. Not brash or fussy, this is a place for people who love great coffee, for people who get giddy at the interesting flavours to be found in a new espresso or filter from Africa or South America. The way they present a choice of three coffees is a wonderful way of introducing someone to speciality coffee, giving customers the chance to try contrast and compare each one and more easily pick out the different flavour notes. Flavour notes are easier to pick out as the coffee cools. All three were of course great, but Clare and I agreed the Chuchu, a washed coffee from Ethiopia was our favourite. After the wedding (congratulations John William & Brooke) we jetted off to Nelson to spend a few days in Ruby Bay and Golden Bay. And no surprise the beaches in these areas were simply breathtaking. It was, however, a bit of a surprise to see a small green boat chug by with signs on the side pronouncing itself, regardless of all the beauty around it, to be first and foremost, a coffee cruise. It’s inescapable, it’s clearly in their DNA. Our visit to Ruby Bay for a day was a great little excursion, as apart from it being yet another beautiful place, it gave us the chance to catch up with a couple of former work colleagues and friends Paul and Maxine Heathcote, who emigrated to New Zealand 12 years ago. They now run a great B&B called Bay View. 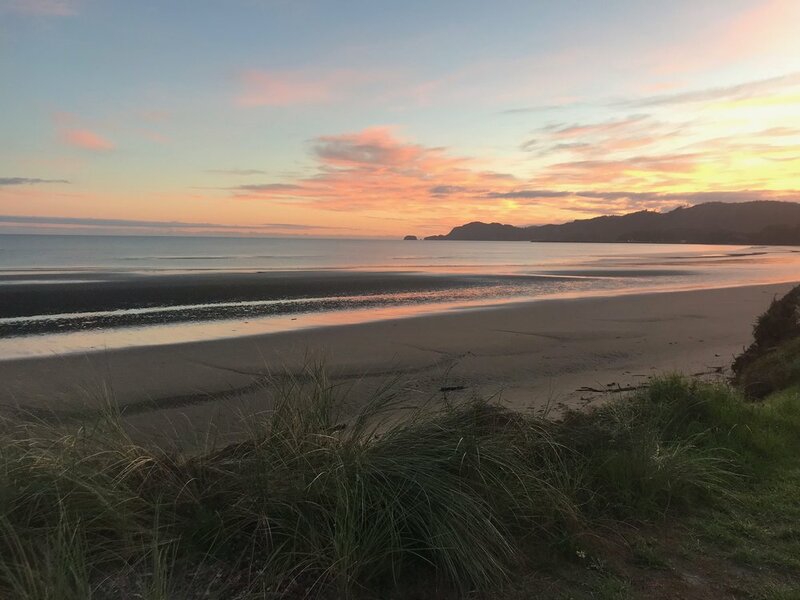 We enjoyed a wonderful walk with them along the beach to Mapua, where we found a great little roastery/shop called Rabbit Island Coffee Company. We bought a 250g bag to bring home to the UK, but unfortunately it got used inside the week. The Golden Bay area is famous for it’s incredible scenery and in truth the coffee tour took a bit of back seat for a few days. The coffee shops we visited other than Rabbit Island were okay, generally offering a reasonable milky coffee. It was in one of these okay coffee shops when I started to realise the staff weren’t always overly friendly and maybe happy in their work. They had a habit of grumbling about being busy or not having enough help. Kiwi’s in general we began to conclude were a bit edgier than we expected and we were soon to discover didn’t like to queue. Our trip to Christchurch was my special treat. When I realised that the England cricket team was in New Zealand at the same time as we were I couldn’t not go to a match. It was one of my bucket list things and once again when I awoke on the morning of the game I felt like a child again. I slipped on my favourite African shirt (how could the cameras possibly miss me as I catch that Jonny Bairstow six with one hand?) Big sporting crowds are something we are used to in the UK, but in New Zealand not so much. The queue to gain access to the ground was enormous. We soon realised a good portion of the crowd wouldn’t get in for the start. This we realised wasn’t a concern for many of the kiwi’s as they took one look at the half a mile long queue and just pushed in. Now us Brits may be a bit rubbish at a lot of things these days, but we do know how to queue. One group, about 20 strong, did it as we neared the entrance and the crowd started to turn. This was all the encouragement Clare needed. I shared and supported her indignance at the rudeness, but why did she have to address her protest at the biggest geezer amongst them. What about the little granny at the front I thought? One of Clare’s many attributes is her tenacity and she was not going to be ignored. She was going to keep chipping away at him until she got a response of some sort. Suddenly turning and looking across me, he dismissively replied, ‘Okay Mrs Social Justice’ and turned back making clear he wasn’t going anywhere. Now that was also rude and very wrong, but on the bright side I didn’t get punched in the face and even better I now had a great little pet name to use in an argument. After the match, which we won with ease, Christchurch city centre beckoned, a place that was sadly decimated by a huge earthquake in 2011. Mark, our host told me it was the biggest financial loss worldwide, ever, not to mention the 185 people who lost their lives. Christchurch is fighting back and doing its very best to recover. Although we didn’t manage to experience much of its coffee scene, as like most places they aren’t open in the evenings. We stayed just outside Christchurch in a place called Sumner, a lovely little town with the standard beautiful beach. The coffee shops were okay, the best being Coffee Culture on Marriner Street. As our time in New Zealand was coming to an end we spent a second day enjoying a different beverage for which New Zealand is also famous. Our previous visit to Martinborough Vineyards was a treat, particularly Poppy’s, where the gorgeous wines, were matched by an absolutely scrumptious platter. Our second visit was to Marlborough and the Wairau Valley area, where we had a fabulous wine tasting and another gorgeous platter at the Giesen vineyard. I love coffee, but in truth, our trips to these vineyards were undoubted highlights. If you visit New Zealand you just have to visit the vineyards. The photo of Clare and Jules below at Coney’s is probably my favourite of the entire trip. Favourite places sometimes creep up on you and on our last outing in New Zealand we were taken to a wonderful little place called Paekakariki. It’s nearby deserted beach was one of Clare’s personal highlights, but in this tiny little place we had coffee and cakes at The Perching Parrot. What a treat. Rustic, laid back a bit ragged, but forget all that lovely friendly vibe and one of the best flat whites of the the entire tour. The atmosphere of any place is that elusive magical x factor, which big companies would just love to own. But they can’t and hopefully never will. Such places are the preserve I believe of the small independents. This is a place worth visiting and if you are wondering no sign at all of a perching parrot! Travelling back to Australia left us with mixed feelings. Leaving Jules, Mark and the remarkable Wellington was a real wrench, but we were both so looking forward to Melbourne. If you speak to anyone about speciality coffee this is the place they talk about as the Mecca. Our hosts on this leg were Mandy and Derek, two lovely people, who were actually South African and just visiting Melbourne themselves. Derek works for a big brewery and his special skills someone decided were needed in Oz. Lucky us! Our first day out saw us visit Prahan Market, a place full of interesting stalls and items I’d never seen before. It’s probably the best example of a market I’ve ever seen. The only cautionary note is that it aint’ cheap. Nothing is in Australia in fairness, it’s expensive. It’s places like this that make taxi drivers charge you $83 for a 15 minute journey. Anyway, more importantly for me at least was that on the edge of this market is the aptly named Market Lane Coffee. This is probably our joint favourite coffee shop of the entire tour. It had great coffee and food, but it also felt good, really good, relaxed, clean. It wasn’t isn’t the best, but that shouldn’t stop it being your favourite. After we left Market Lane we were both full of optimism commenting that if this was the standard, then we were in for some real coffee treats. The next day we decided to put the train system to the test arriving at Flinders Street station just in time for lunch. I was getting that Christmas feeling again. Sensory Lab was one of the places we were keen to try as was our host Mandy, who after Market Lane was getting a real feel for this coffee thing. She ordered herself a filter and we taught her the cupping / slurping technique. It helps release the flavours and aromas. Mandy was now a fully fledged convert. Sensory lab didn’t disappoint and although they don’t do much on the food front the cakes were ‘scrummy’ as Clare would say. Visits to Brother Baba Budan followed, a small but very busy place churning our take outs at an incredible rate. Then onto Duke Street Roastery, another small but popular place, big on cakes. We didn’t have time to make the short trip out of town to St Ali’s, but we were happy to save that prospect for another day. 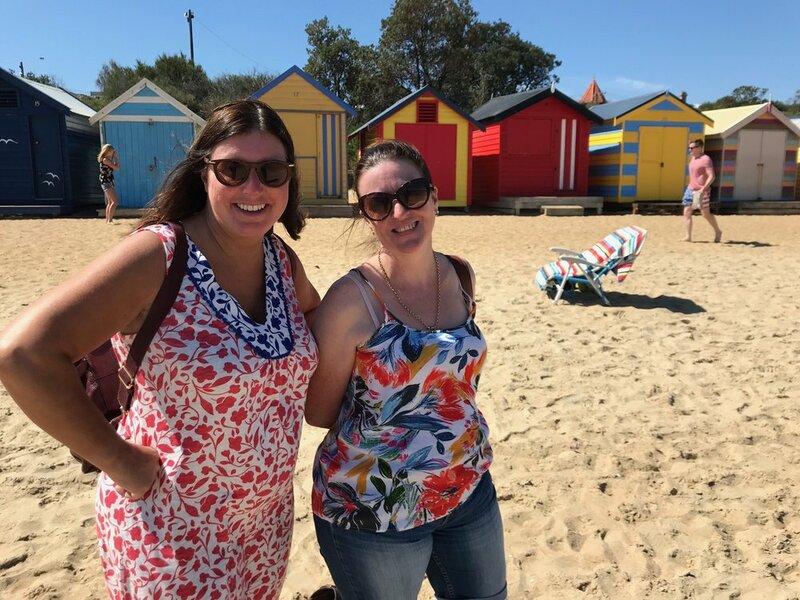 The next few days saw us sampling Melbourne’s beach scene. Very lovely and again bathed in delightful Autumn sunshine, which by the way gets the temperature up into the high 20’s. 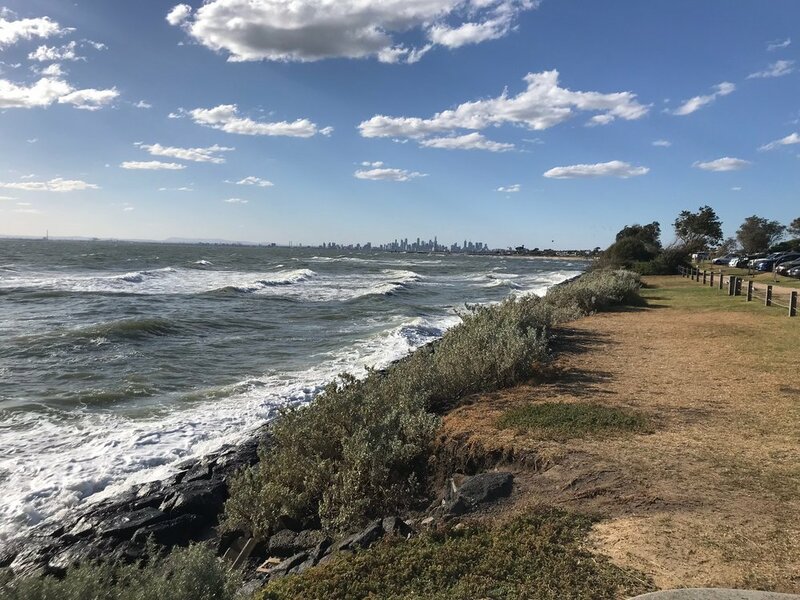 St Kilda and Brighton Beach are just two of the most popular Melbourne beach hot spots. And if you have a tanned six pack physique its a very good place to strut your stuff and boy did the Aussie guys like to do just that. Can’t say the much more laid back Aussie girls seemed that impressed or maybe I was just hoping that was the case. We visited a couple of nice and very popular beach front eating places Republica and Brighton Baths, but as they weren’t coffee places I’ll move on. Our eventual visit to St Ali saw us team up with a former member of the Marmadukes staff, Zak. She had returned to Melbourne at the back end of last year, even thought she’s actually from New Zealand. Her reason is that Melbourne is much more exciting and I can see that from a younger person’s perspective. Zak hadn’t ever been to St Ali as it was just outside the centre, so she too was looking forward to what the famous St Ali had to offer. In the end it was more of a relief that St Ali was so good. Built up as it was it could so easily have been a disappointment. It was nothing of the sort, it instantly had that speciality coffee shop vibe, busy, buzzy, a mixed demographic, a bit edgy. We had a wonderful lunch and even bought a t shirt (their last one actually) Unfortunately it was way too small for me so our son TJ is now the proud owner. One of the things Australia is famous for is its wildlife, particularly I suppose the dangerous variety. We opted however for a trip to the Moonlit Wildlife Sanctuary, where we both got to cuddle a Koala and a very chilled jungle python called Pug. And yes, even there, we enjoyed some pretty good coffee. This is the biggest difference between here and there you can get a pretty good flat white or latte just about anywhere in Australia. Filters, much less so, but overall the standard is without doubt much higher. As the final leg of our grind tour neared we bid farewell to our Australian hosts at the posh Rosetta restaurant on Melbourne’s Southbank. The build up to the coming weekends F1 Grand Prix was well under way with stalls and techy looking people all around us. Now, I’ve already mentioned that Australia is a bit on the pricey side, well Rosetta, for someone like me, was on first glance a step too far. For some reason the waiter handed me the wine list, so that first glance was perhaps not surprisingly at the price column, which I noted had at least 3 numbers against each bottle. Ironically I so needed a drink at that point. Sometimes in life though you just have to go with the flow and this was one of those occasions. After having more than my fair share of the first bottle of wine I ordered another and forgot how expensive everything was or at least I did until the bill was presented, also to me. Derek, no doubt seeing the look of shock sweep across my face quickly threw over his card and said let’s split it. In spite of the expense Rosetta was terrific. Melbourne was everything and more we hoped it would be and once again we were very sad to leave it and our kind, wonderful hosts. Having people to take care of you and be your guide may not be everyone’s idea of a big adventure, but it certainly worked for Clare and I. Words cannot express how grateful we still are for the incredible kindness and hospitality of Mandy and Derek and before them Jules and Mark. Singapore boasts one of the most expensive, lavish hotels in the world, the Marina Bay Sands. What an awesome, mind blowing sight it is. Heights aren’t really my thing, but there was no way I wasn’t going to get up there and enjoy the most spectacular view I have ever seen in my life. by chance being roasted on the other side of some glass doors. The warmth of the beans could still be felt from the bag of beans we bought. The final place we visited was a bustling coffee bar and roastery called CSHH. Super busy place, which was Dexter informed us turned form a hardware store into a coffee bar by a son who felt he had a different calling from his dad. Good decision. After sampling some of the local food as Dexter called it, we left our wonderful host and headed for the airport. Our 5 weeks were almost up and tour over. Experiences like this don’t happen often in life. Even if we went back again, which we undoubtedly will, there won’t be that unique excitement that comes with experiencing something for the very first time. That makes me a little sad in truth. We had the most enjoyable, informative, and at times exhilarating experiences. Many of the things we did, places we visited I haven’t included, because there isn’t the space and I wanted my story to be like that little green boat, first and foremost about the coffee. So, are they better than us in New Zealand and Australia? Yes, I would have to concede they are, but there is no doubt that we are catching them up. The UK is a hot bed of creativity and entrepreneurship. There are an ever increasing number of interesting speciality coffee shops springing up in every part of the country. There is a love for coffee, for good coffee and I would invite anyone who hasn’t experienced the taste of good coffee to give it a try. Certainly if you want your first taste pop into Marmadukes and ask the barista for a try of the days batch brew. The London Coffee festival begins on the 12th April. It gets bigger every year and is well worth a visit. The espresso martini’s aren’t the best, but it’s an interesting snapshot of what’s happening in the coffee industry. And finally, if one day you think you might want to go on a grind tour of your own my advice is why wouldn’t you. They are places worth visiting regardless of the coffee on offer. The coffee for Clare and I made a special trip an extra, extra special one.